Two years back, I wrote a post titled Offbeat Getaways in Goa- talking about its spice plantations, churches, latin quarters etc. That post already seems old now. I know enough people who are now exploring the lush green spice plantations and chilling out at one of the many cafés in Latin Quarters. But, Goa never ceases to surprise me. I am back again and again in this state every year for new discoveries and experiences. 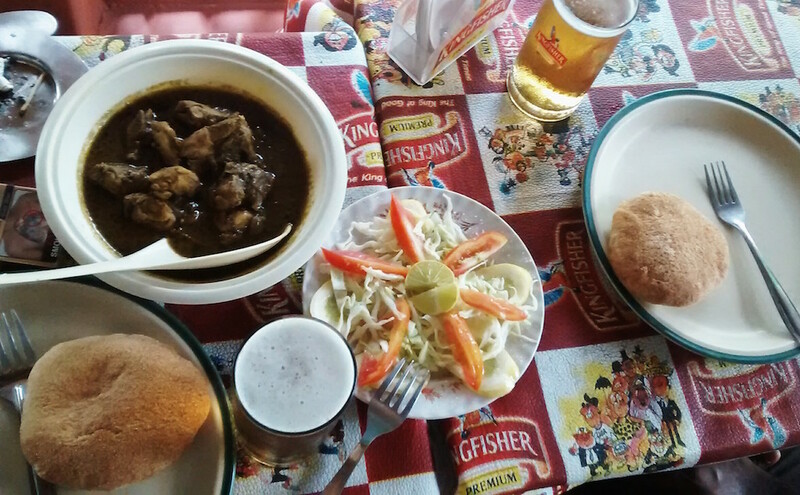 This monsoon was all about exploring Goa’s islands and little gems in its hinterlands. Goa has several inhabited islands. While most of them are now connected by road or bridge to the mainland, there are a few where the only mode of approach is a ferry. Let’s dig in some interesting bits about these islands and other discoveries I made in Goa this year, including a gushing waterfall and a placid lake. Divar is probably the most characterful and charming island in Goa. Its narrow streets amidst rich green vegetation are dotted with several traditional Portuguese villas painted in hues of mustard and blue. A visit to the Church of Our Lady of Compassion on the hilltop gives a bird’s eye view of Old Goa. As I rode through the island, I could get a sense of prosperity in this island- it has its own bus service, there are simple bar & restaurants in every other corner serving fresh and delectable Goan food, there is a quaint Ayurveda Spa Resort, a few pretty decent accommodation options and people in general seeming happy and content. 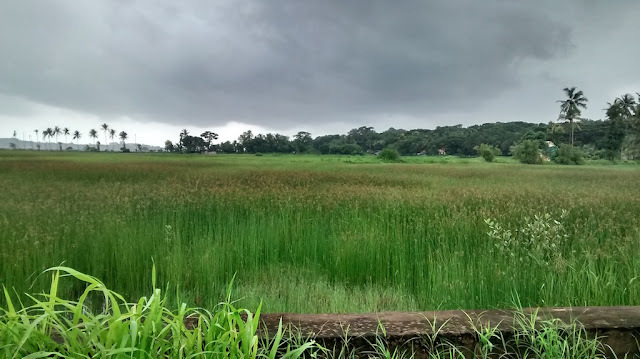 A little drive deep into the island will reveal its vast expanse of agricultural fields, and there is indeed no time better than monsoons to witness the swaying lush greens. 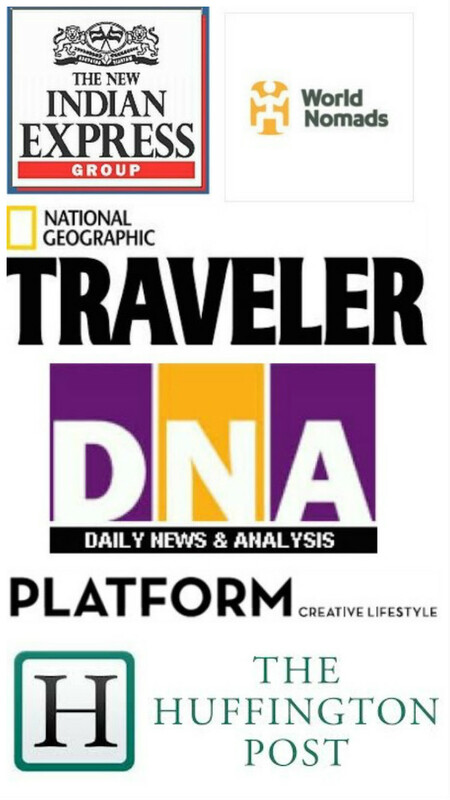 Getting there: Hop onto a ferry from any of these ferry points- Old Goa, Ribander, Narve. Pedestrians and bikes get a free ride, cars pay Rs. 8 one-way. 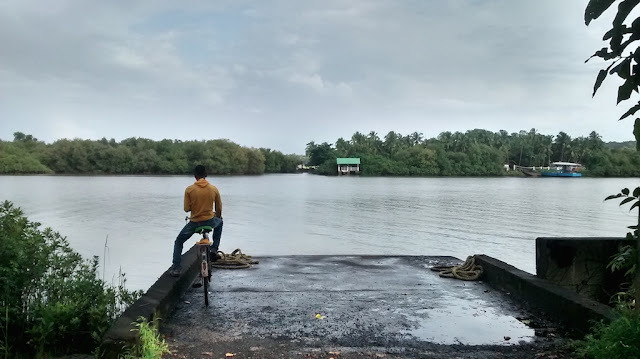 Vashi Island is a small nondescript island near Divar. Its surprising to see, how a handful of families living on the island have chosen to stay here and keep their territory safe from private builders and real estate buyers. The island does not have the grandeur of Divar, but does have a charm of its own. Most of the island is covered with crop fields and a dilapidated church forms its centre. It was on this island I first saw weaver birds chirping noisily around their hanging nests. There are no restaurants or accommodations for visitors here. A short ferry ride away from Divar, Vashi can be explored in less than an hour. Home to Salim Ali Bird Sanctuary, Chorao Island is one real gem in Goa. It could be of great interest to bird watchers or those like me, who are interested in seeking offbeat trails. I landed in this island one late afternoon when the streets were empty and whatever bare shops and eateries it has- shut down for afternoon siesta. I had remembered reading about Lafayette Restaurant and knocked at its door. True to her reputation, the lady owner Fatima opened the door sleepily but agreed to cook something despite her ‘off hours’. In her own words- “I do not like to return hungry visitors from my door”. Look what she rustled up for us ! Isn’t it incredible meeting such wonderful souls during your journeys ? Sleep: Island does not have too many accommodation options. Few basic home run guesthouses are available. Even Lafayette offers few refurbished rooms to guests. Getting there: A ferry ride from Ribander will bring you to Chorao Island. This little wonder is located in North Goa. I used to think I have explored length and breadth of North Goa. Obviously, I was wrong. Harlem caves and waterfall came about as another new discovery this monsoons. 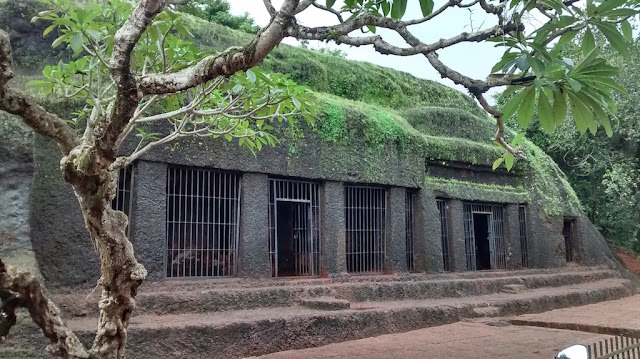 Harvalem caves are also known as Pandava Caves and are dated as back as 6th Century. It is widely believed that the Indian mythological figures- Pandavas, sought refuge in these caves, while some others talk about its Buddhist origins. At a short distance from the caves is the gushing Harvalem waterfall. The mist thrown back up from the waterfall is dense enough to make you cover yourself with an umbrella or raincoat ! 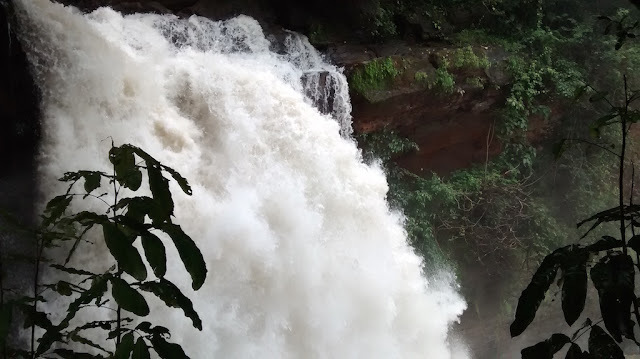 Be very careful when visiting waterfall in the monsoons, as the short stairway leading upto it can become very slippery. 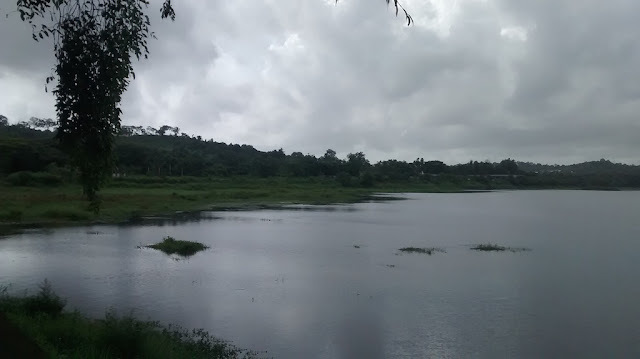 Yet another bird watchers’ paradise, Karmali lake is located at a short distance from Old Goa. 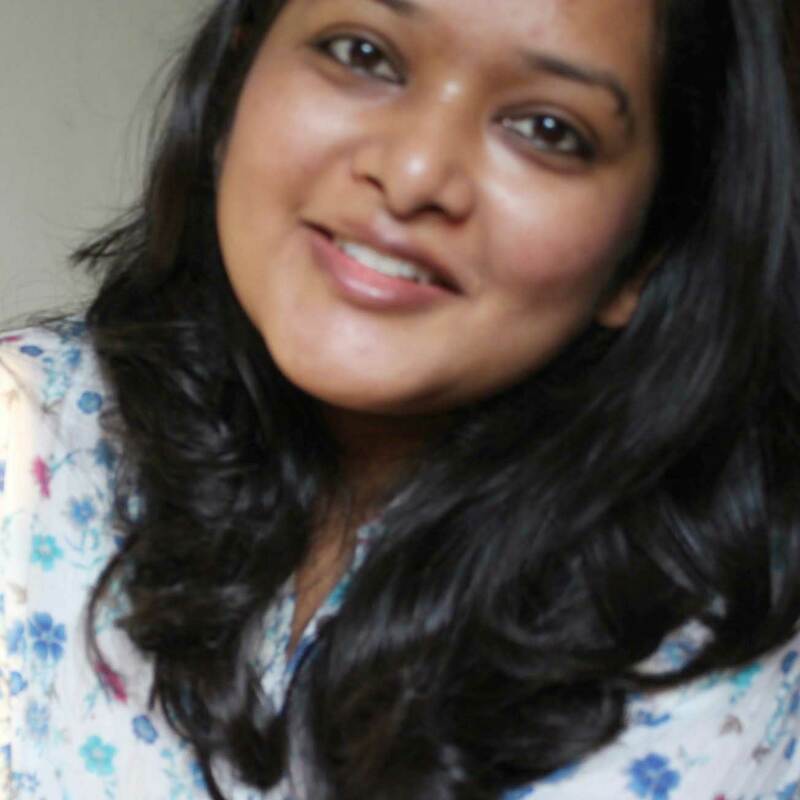 A fellow traveller and now a friend recommended this place when I met her in Goa this monsoons. She was right, the placid Karmali lake could be a nice little hangout during evening or early mornings. Parts of it can become a marshland during summers and is a great spot for bird watching or simply having a picnic under the shade of trees lining the pathway overlooking the lake. Wow, I love the picture of the food. How was it? This looks so neat, placid and a unique side of Goa..